When it snows, I make soup. When I make soup, I always think about the health benefits of thyme. Though I harvested and dried thyme for winter use, I prefer to throw in a handful of fresh thyme whenever I can. As my pot of soup started to simmer, I peeked out my kitchen door and found my thyme plant standing tall among the snow and cold, signaling to me that is ready for a trim. Though thyme is native to sunny and warm southern Europe along the Mediterranean, its woody structure and tiny leaves have enabled it to adapt to a variety of climates. 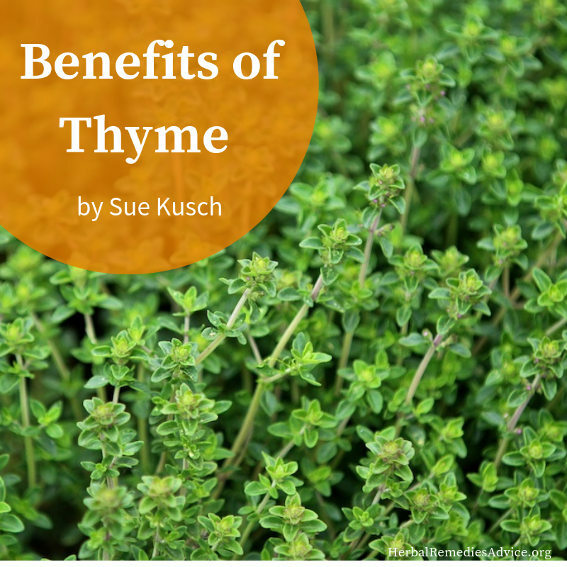 Long before thyme was brought into the kitchen for flavor, it was historically used as medicine, primarily against bacterial infections. Thyme has strong antimicrobial properties and, before WWI, was one of the herbs used to disinfect the air by steaming in hospitals and military infirmaries. In my home, thyme is a primary cleaning agent: I steep it in distilled white vinegar and use it to clean my bathroom and kitchen. Thyme can be especially effective as an antiseptic gargle for inflamed gums and throats and as a topical wash for wounds and bites. Thyme is also effective with fungal infections, including vaginal yeast infections. And while on the subject of cleaning up the body, thyme has historical use as a vermifuge to help rid the body of parasites and worms. There are multiple herbs that are useful for colds and influenza but sometimes immediate access can be a problem. Thyme is probably one of the most common herbs in gardens because it is easy to grow and is quite hardy. So it makes sense that folk healers would utilize a plant that was easy to access to help with lung congestion and coughing spasms. Europeans have traditionally used thyme to help with the dry hacking cough associated with whooping cough. In addition to its use as a soup herb, thyme can be sprinkled on roasted and steamed vegetables, fish, eggs and meat. You can also Infuse white wine vinegar and olive oil with a few sprigs of fresh thyme and use for vinaigrette dressings and marinades. Infusing honey with thyme is useful both in the kitchen and as a remedy for sore throats and coughs. When I started exploring medicinal herbs I often tried them first as teas. I like strong-flavored herbal teas and generally double the suggested amount. I can still remember the hot and spicy taste of two big teaspoons of dried thyme in a small cup of hot water. Whoa! 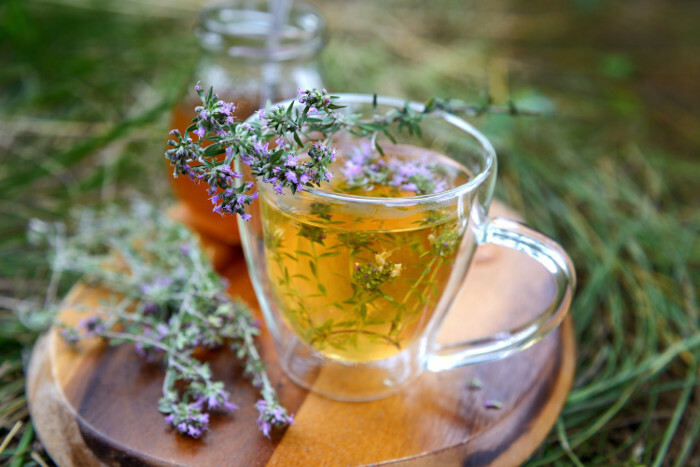 But thyme herbal tea is one of the best ways to drink your medicine for upper respiratory concerns, digestive spasms or gas, for an afternoon pick-up or even mild aches and pains. Thyme tea on its own is pungent so I like the recipe below and make this as an after-meal tea to support my digestive processes. Steep 1 tablespoon of the mixed dried herbs with 12 oz of just-boiled water. Cover and let steep for 5 - 10 minutes. Sweeten with honey if desired and enjoy while warm. Oxymels are easy to make and ideal for winter illnesses. I like to include berries in my oxymels because they can really brighten up both the oxymel and the day when I use them! You can use fresh or thawed frozen berries and fresh or dried thyme for this recipe. Mix all ingredients in a quart glass jar. Use a plastic lid (vinegar interacts with metal) and set aside in your kitchen so you view it each day. Shake jar gently each day to keep the fruit and herbs moving around. After 2 weeks, strain, taste and adjust with honey, if desired. Take it by the tablespoon for cough and sore throat, mix 1 ounce with sparkling water for a tangy refreshing drink or make a salad dressing with this fruity herb mixture. Sue Kusch, a former community college instructor and academic advisor, incorporates her experiential wisdom, expertise and science-based research garnered from her three decades of growing vegetables, fruit and herbs into her educational writing about plants and how people use them. In addition to her BA in Social Sciences and Masters in Education, she completed the Master Gardener training in 2011 and two permaculture courses in 2001 and 2014. 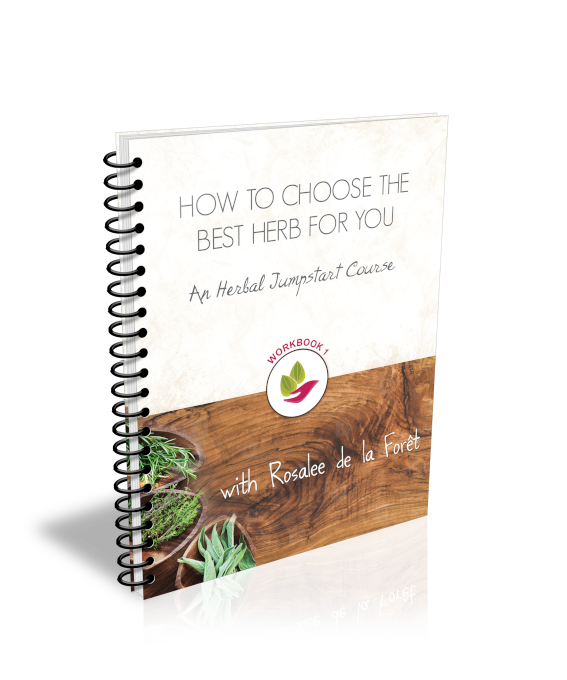 She has studied medicinal and nutritional uses of herbs, including studies at Herbmentor and East West School of Planetary Herbology, since 1997. 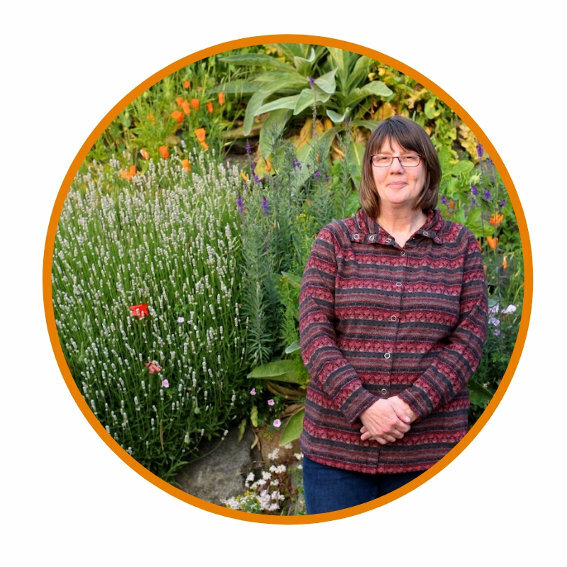 An avid reader, lover of historical and folkloric information, and a promising storyteller, Sue writes about the intersection of plants and people at www.plantsnpeople.com.